Nvidia's CUDA has been hailed as "Supercomputing for the Masses," and with good reason. Amazing speedups on scientific / technical code have been reported, ranging from a mere 10X through hundreds. It's become a darling of academic computing and a major player in DARPA's Exascale program, but performance alone is not the reason; it's price. For that computing power, they're incredibly cheap. As Sharon Glotzer of UMich noted, "Today you can get 2GF for $500. That is ridiculous." It is indeed. And it's only possible because CUDA is subsidized by sinking the fixed costs of its development into the high volumes of Nvidia's mass market low-end GPUs. Apparently ignored in the usual media fuss over Intel's next and greatest, Sandy Bridge, is the integration of Intel's graphics onto the same die as the processor chip. The current best integration is onto the same package, as illustrated in the photo of the current best, Clarkdale (a.k.a. Westmere), as shown in the photo on the right. As illustrated, the processor is in 32nm silicon technology, and the graphics, with memory controller, is in 45nm silicon technology. 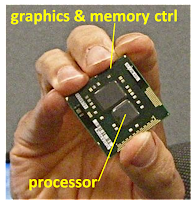 Yes, the graphics and memory controller is the larger chip. Intel has not been touting higher graphics performance from this tighter integration. In fact, Intel's press releasers for Clarkdale claimed that being on two die wouldn't reduce performance because they were in the same package. But unless someone has changed the laws of physics as I know them, that's simply false; at a minimum, eliminating off-chip drivers will reduce latency substantially. Also, being on the same die as the processor implies the same process, so graphics (and memory control) goes all the way from 45nm to 32nm, the same as the processor, in one jump; this certainly will also result in increased performance. For graphics, this is a very loud the Intel "Tock" in its "Tick-Tock" (architecture / silicon) alternation. So I'll semi-fearlessly predict some demos of midrange games out of Intel when Sandy Bridge is ready to hit the streets, which hasn't been announced in detail aside from being in 2011. Probably not coincidentally, mid-2011 is when AMD's Llano processor sees daylight. 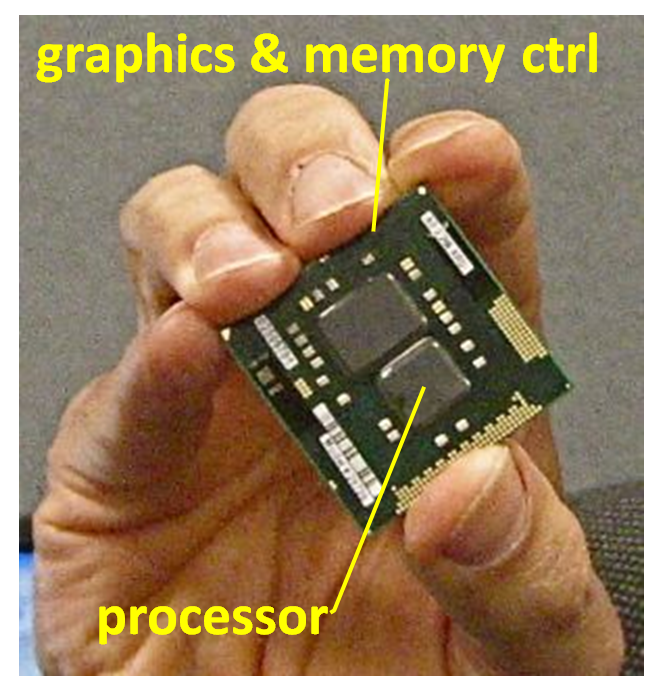 Also in 32nm silicon, it incorporates enough graphics-related processing to be an apparently decent DX11 GPU, although to my knowledge the architecture hasn't been disclosed in detail. Both of these are lower-end units, destined for laptops, and intent on keeping a tight power budget; so they're not going to run high-end games well or be a superior target for HPC. It seems that they will, however, provide at least adequate low-end, if not midrange, graphics. Result: All of Nvidia's low-end market disappears by the end of next year. As long as passable performance is provided, integrated into the processor equates with "free," and you can't beat free. Actually, it equates with cheaper than free, since there's one less chip to socket onto the motherboard, eliminating socket space and wiring costs. The power supply will probably shrink slightly, too. First, prices will rise. It will no longer have a huge advantage over purpose-built HPC gear. The market for that gear is certainly expanding. In a long talk at the 2010 ISC in Berlin, Intel's Kirk Skaugan (VP of Intel Architecture Group and GM, Data Center Group, USA) stated that HPC was now 25% of Intel's revenue – a number double the HPC market I last heard a few years ago. But larger doesn't mean it has anywhere near the volume of low-end graphics. The second result will be that Nvidia become a much smaller company. But for users, it's the loss of that subsidy that will hurt the most. No more supercomputing for the masses, I'm afraid. Intel will have MIC (son of Larrabee); that will have a partial subsidy since it probably can re-use some X86 designs, but that's not the same as large low-end sales volumes. So enjoy your "supercomputing for the masses," while it lasts.